(Nanowerk News) Iridescence, or sheen that shifts color depending on your viewing angle, is pretty in peacock feathers. But it's been a nuisance for engineers trying to mimic the birds' unique color mechanism to make high-resolution, reflective, color display screens. Now, researchers at the University of Michigan have found a way to lock in so-called structural color, which is made with texture rather than chemicals. A paper on the work is published online in the current edition of the Nature journal Scientific Reports ("Angle-Insensitive Structural Colours based on Metallic Nanocavities and Coloured Pixels beyond the Diffraction Limit"; open access). 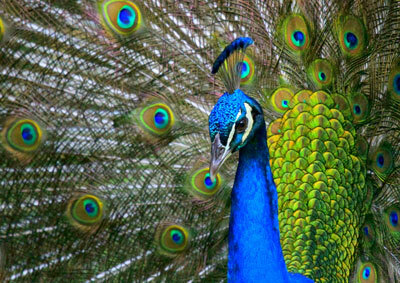 In a peacock’s iridescent tail, precisely arranged hairline grooves reflect light of certain wavelengths, resulting in brilliant color that looks different depending on the movement of the animal or the observer. Imitating this system – minus the rainbow effect – has been a leading approach to developing advanced color reflective displays. University of Michigan researchers have taken a step toward that goal. In a peacock's mother-of-pearl tail, precisely arranged hairline grooves reflect light of certain wavelengths. That's why the resulting colors appear different depending on the movement of the animal or the observer. Imitating this system—minus the rainbow effect—has been a leading approach to developing next-generation reflective displays. The new U-M research could lead to advanced color e-books and electronic paper, as well as other color reflective screens that don't need their own light to be readable. Reflective displays consume much less power than their backlit cousins in laptops, tablet computers, smartphones and TVs. The technology could also enable leaps in data storage and cryptography. Documents could be marked invisibly to prevent counterfeiting. Led by Jay Guo, professor of electrical engineering and computer science, the researchers harnessed the ability of light to funnel into nanoscale metallic grooves and get trapped inside. With this approach, they found the reflected hues stay true regardless of the viewer's angle. "That's the magic part of the work," Guo said. "Light is funneled into the nanocavity, whose width is much, much smaller than the wavelength of the light. And that's how we can achieve color with resolution beyond the diffraction limit. Also counterintuitive is that longer wavelength light gets trapped in narrower grooves." The diffraction limit was long thought to be the smallest point you could focus a beam of light to. Others have broken the limit as well, but the U-M team did so with a simpler technique that also produces stable and relatively easy-to-make color, Guo said. "Each individual groove—much smaller than the light wavelength—is sufficient to do this function. In a sense, only the green light can fit into the nanogroove of a certain size," Guo said. The U-M team determined what size slit would catch what color light. 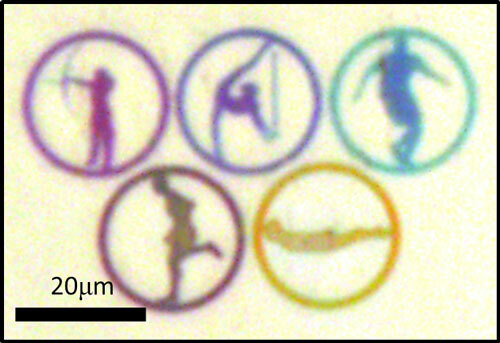 Within the framework of the print industry standard cyan, magenta and yellow color model, the team found that at groove depths of 170 nanometers and spacing of 180 nanometers, a slit 40 nanometers wide can trap red light and reflect a cyan color. A slit 60 nanometers wide can trap green and make magenta. And one 90 nanometers wide traps blue and produces yellow. The visible spectrum spans from about 400 nanometers for violet to 700 nanometers for red. "With this reflective color, you could view the display in sunlight. It's very similar to color print," Guo said. To make color on white paper, (which is also a reflective surface), printers arrange pixels of cyan, magenta and yellow in such a way that they appear to our eyes as the colors of the spectrum. A display that utilized Guo's approach would work in a similar way. 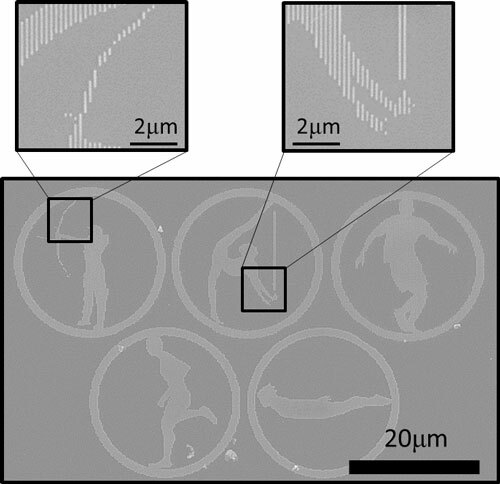 To demonstrate their device, the researchers etched nanoscale grooves in a plate of glass with the technique commonly used to make integrated circuits, or computer chips. Then they coated the grooved glass plate with a thin layer of silver. When light—which is a combination of electric and magnetic field components—hits the grooved surface, its electric component creates what's called a polarization charge at the metal slit surface, boosting the local electric field near the slit. That electric field pulls a particular wavelength of light in. Right now, the new device can make static pictures, and the researchers hope to develop a moving picture version in the near future.